DTSF150 is a new-designed single phase multi-tariff energy meter on the basis of State Grid standards to meet the requirements of building "a comprehensive strong and smart grid". Power Consumption: When the meter is working on the reference current, temperature and frequency, active power,and apparent power in the voltage circuits should be no more than 1.5 W and 10 VA in the status of non-communication or no more than 3W,12VA in communication state. the capacity of long life li-battery installed into the meter is more than 1.2Ah, and there is no need to replace it during expected lifetime of the meter. It can keep the built-in clock working correctly for more than 5 yeas even there is no power. When the battery is short of voltage, the meter can send indicator and give an alarm automatically. hansi-font-family:Arial;mso-bidi-font-family:Arial;color:rgb(0,0,0);font-size:10.0000pt;mso-font-kerning:0.0000pt;" >functions of energy measurement, information storage, processing and interaction . Measure positive direction active energy and reversed direction active energy. Time-sharing measurement: the active energy consumption is accumulated and saved corresponding to the point, peak, smooth and trough period. total quantity should not use the summation method by adding up each tariff or consumption quantity of each period. Clear up the data stored in the meter, such as energy consumption, frozen quantity and event records etc. The reset operation should be recorded as event permanently to prevent from being operated by unauthorized person. Bottom value of distortion meter must be reset and cannot be programmed any more. Record the total time of programming actions, the time of the last ten programming actions, operator code and data identification of programmed items. Record the total numbers of time calibration (excluding time broadcasting) and the time of the last ten programming actions, operator code. Record the total times of power failures, the beginning and ending time of last ten power failures. d. Record the total times of opening the cover and the beginning and ending time of last ten case opening and data of energy consumption. The meter just records the earliest case opening during power failure. It supports automatically cyclic display mode and button pushing display mode, and the time interval of automatic cyclic display can be set within 5 and 20 seconds. LCD screen is in backlist mode if operating the button or infrared communication during the normal work. After that, the backlist will be closed automatically if there is no action within 60 seconds; When the infrared is triggered, the backlist will be closed after cycling twice. LCD screen will be closed once being powered-off, and it can light up again using the button, if there is still no action, it will be closed after cycling once. The screen will be into sleep mode after pressing button for 30 seconds. It's not allowed to use infrared for the purpose of saving battery power. Displayed information is showed as digital, code and symbol. 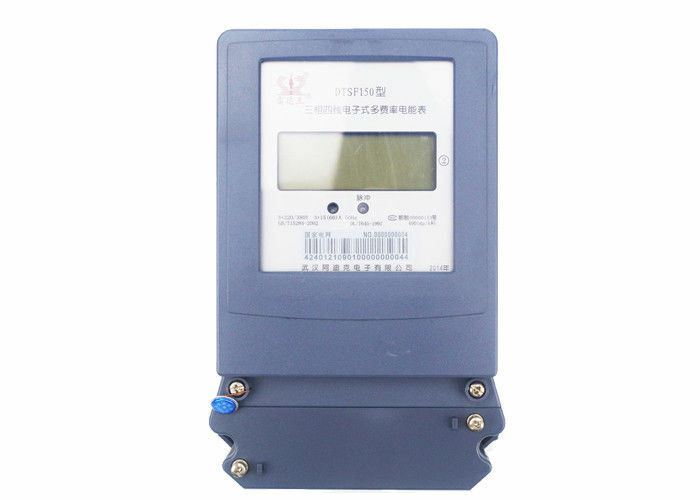 The meter can display the values of electricity consumption quantity, power and time with the digits of 8 bits, and the the bits of decimal can be programmed. The units of theses parameters are as per requirements of the state legal measurement units, such as kW, kWh etc. The symbols showed on the screen stand for power direction, rates, programming status, communication status,low-battery warning and malfunction and the display contents are encoded as code and can be programmed as well (refer to Annex C). The parameters can be fully displayed on the LCD after being powered on for one second, and backlight lights up; The default lighting time of LCD screen and backlight is 5 seconds and the time interval can be set between 5 and 30 seconds. The meter can make screen full displayed for 10 seconds through communication command. The physical layer of communication channel must be independent that any of channels cannot affect others once being damaged during the communication, the meter performance, stored data and parameters should be not affected as well. Either modulated infrared or RS485 communication has the same authority to set or read the meter, and both can realize the required functions of DL/T 645－2007. It supports spontaneous reports when an important event occurs.